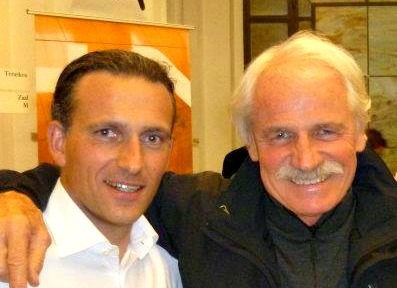 In April 2015 Bert Poffé visited Raphael Fiegen in Esch-sur-Alzette, Luxembourgh for the Wild And Adventurous BENELUX Expedition 2015. After a day of mushing (quad) together in the green woods of Luxembourg, both adventurers started talking about possible future expeditions together and about a way to support GoodPlanet Belgium. Hours later both adventurers went home with a new project: THE KUNGSLEDEN DOGSLED EXPEDITION 2016. In the extreme north of Sweden, a hundred miles (160 kilometers) inside the Arctic Circle, hides the last remote wilderness in Western Europe. This is Lapland, and through it runs Kungsleden. 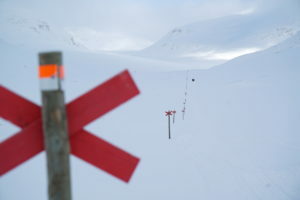 The “King of Trails” is a 275-mile (443-kilometer) route between Abisko in the north and Hemavan in the south. an expansive landscape of birch forests, hidden glaciers, powerful rivers, and the highest mountains in Sweden. Kungsleden runs through four national parks and a nature reserve. In the midst of the Swedish Arctic winter, Raphael, Bert and the dogs will travel the 450 kilometers on the famous Kungsleden between Hermavan and Abisko. Raphael’s 10 dogs have been part of a well-trained team for over 10 years. While still standing strong, for some of them it will be their last big adventure before retiring while for others it will only be the beginning of a long career as expedition-dogs.The Luxembourg-Belgian team will be on the Kungsleden trail for around 20 days, plus or minus a few. Blizzards might hold them up for several days. If good progress is made, they will take time for extra exploration on snowshoes. start exploring our precious planet. Document the effects of climate change in Lapland, interviewing the few people we will be meeting on the trail. Collect funding for a a variety of GoodPlanet nature reconnection programs for children. 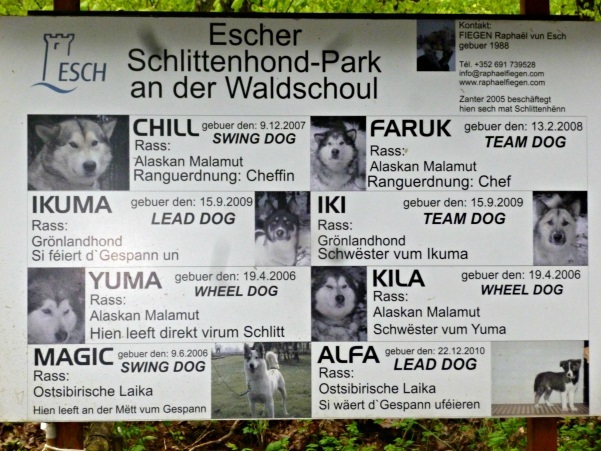 Raphael Fiegen is one of the very few mushers from Luxemburg. He started mushing in 2006 under the patronage of French dogsledder Nicolas Vanier and has personally witnessed the effects of climate change in the Lapland region. His passion lies not only in dog-sledding, but also in the wildness of these magical Arctic regions. 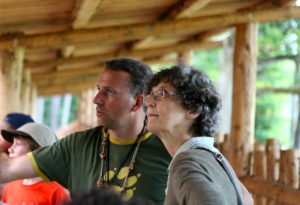 Belgian explorer Bert Poffé has a special interest in the First Nations of the North, and indigenous people and nomads in general. Travelling through wild places and learning from nature is what he loves most. He has met many inspiring people of different Canadian First Nations such as the Anishnabe, Atikamekw, Huron and Mic Mac, and has lived with several nomadic Mongolian families. Bert is also a rewilding coach, inspiring people to reconnect with nature and with their wilder self in order to gain optimal physical and mental health. 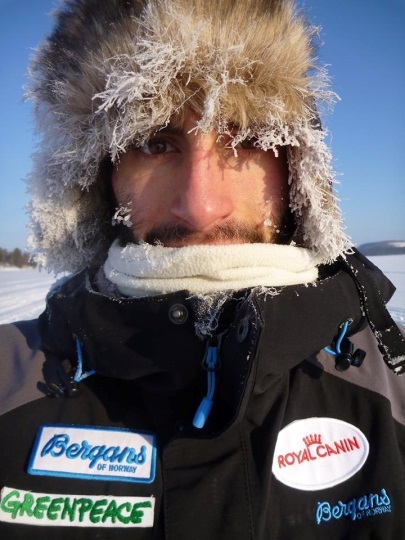 Film maker Romain Gierenz (Lux) will make the documentary “ON 40 PAWS” about Raphael and Bert’s Kungsleden Dogsled Expedition 2016. 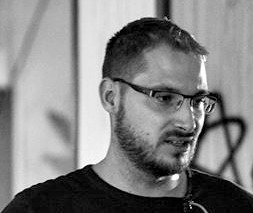 Romain studied film and media in Stuttgart and works as a film maker since 2013. He worked primarily in the field of promotional films but recently decided to dedicate himself exclusively to storytelling, in order to be able to promote thrilling projects. The documentary “On 40 Paws” appeals to him in particular, because he aims to reach people’s interests in what motivations in life does one gain from spending 3 weeks in the wilderness? alternative lifestyles: Are we slowly losing our connection to nature? How can we reclaim our affinity to nature and the peace it provides? The Domaines des Grottes de Han is right in the middle between Bert (in Leuven, Belgium) and his expedition team mate Raphael Fiegen (in Esch-sur-Alzette, Luxembourg). I am happy they use the Domaine as a meeting point to prepare for the expedition. As board member of GoodPlanet Belgium and administrator of a wild animal reserve, I fully share with Bert and Raphaël the passion for nature and wildlife. I fully support their expedition and the efforts of this Luxembourg-Belgium team to raise funds for GoodPlanet Belgium. I am happy and honored to be the patron of Bert Poffé’ and Raphael Fiegen’s “Kungsleden Dogsled Expedition 2016”. I know Bert from his PR work for GoodPlanet Belgium, but I also know him as a passionate explorer, advocating for the environment and the indigenous peoples around the world. In fact we both try to contribute to making this planet a GoodPlanet, I use camera’s and images, Bert inspires through his expeditions and adventures. 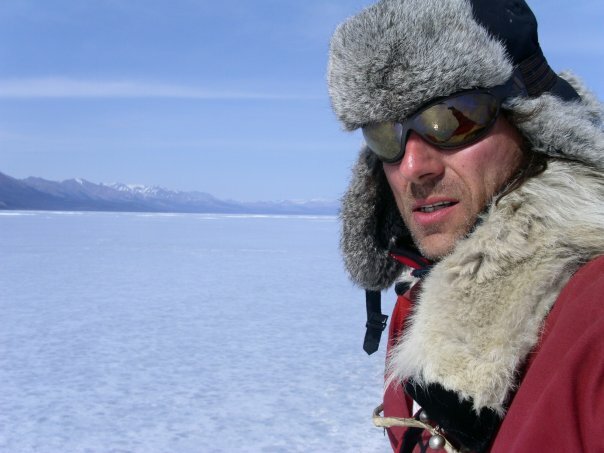 Bert’s expedition partner, dogsledder Raphael Fiegen is involved in Greenpeace Luxembourg. Apart from reaching their personal goals, the expedition team wants to raise funds for the “nature reconnection” projects of GoodPlanet. No doubt Raphael and Bert will need perseverance and motivation to cope with the Arctic’s harsh environment that they are heading into this coming February. Your gift to GoodPlanet Belgium will be that extra motivation for them. Long term INUKSUK partner co2logic will offset the CO2 emissions from the flights and the car transport to the startpoint in Hemavand Fjallcenter and back home after arrival in Abisko. On February the 22nd, 2016, Musher Raphael Fiegen and explorer Bert Poffé departed from the village of Hemavan to travel almost 500 kilometers on the famous Kungsleden, with arrival planned in Abisko. 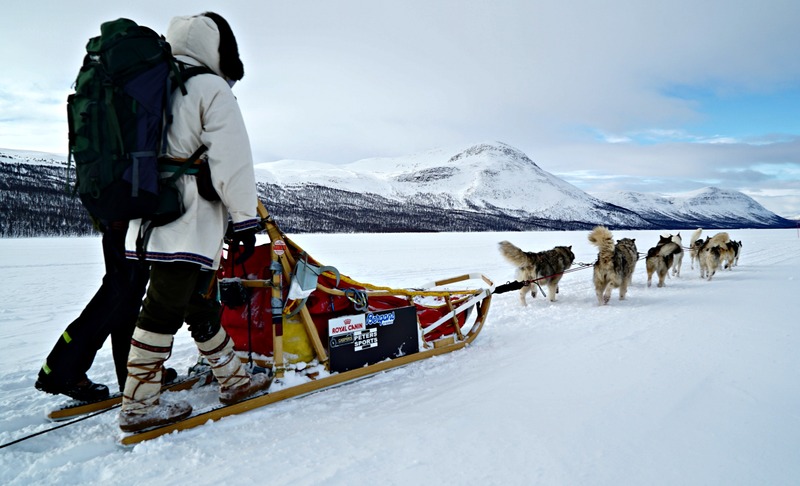 Their intention was to travel Kungsleden unsupported, with one sled and 10 dogs, including food and gear for themselves and the 10 dogs for 20 days. However, things didn’t go as planned. 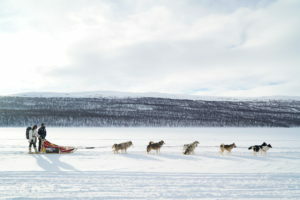 The combination of the (too) heavy sled for the slopes of the Kungsleden, deep fresh powder snow, the absence of a good frozen trail, and a dog team that was making its last trip before retirement made the team quickly realise that these circumstances would not allow them to cover the 500 km to Abisko. Fearing for the health of the dogs, especially the acute risk of hip injuries and exhaustion with even more severe consequences, the musher Raphael wanted to continue, but finally opted for the well being of the dogs, which Bert agreed with fully. Eventually they decided to interrupt the expedition at Ammarnäs, a small village of three streets and a few houses deciding that this was the best place to pull out and return to civilization. After Ammarnäs, continuing the expedition would have taken the team and dogs into terrain would go straight uphill, and also making any cancellation and pull-out much more difficult and dangerous for the team. It takes time to come to terms with the fact that they didn’t reach the goal they set for the expedition but the expedition did not ‘fail’. The team travelled through one of the most beautiful landscapes in the world and all came back safe and sound. Raphael and Bert learned a great deal from this experience, perhaps more than the adventures and expeditions that successfully achieve their objectives. The two explorers and last but not least the 10 dogs, Kenai, Ikuma, Magic, Chill, Alfa, Faruk, Iki, Kila, Nayeli and Yuma, and l film director Roman Gierenz; the man who had to learn snowmobiling in just one week and had to film in sometimes severe and harsh conditions without any support of a film crew, have become friends for life.